Wire loom tubing is a typical cable management solution that allows you to organize wire and cables in your office and protect them from abrasion, water. They are two kinds of types, split and non-split. It is easy to cut into sizes. Generally, we’ll offer heat and flame resistant ability, such as V0, V1, V2 etc. There are different kinds that exist to help for different things, such as heat resistant and flame retardant varieties. The purpose of wire loom tubing is to create an extra layer of protection for your cables. The level of protection needed depends on your particular situation. Conduit has the similar construction to wire loom. 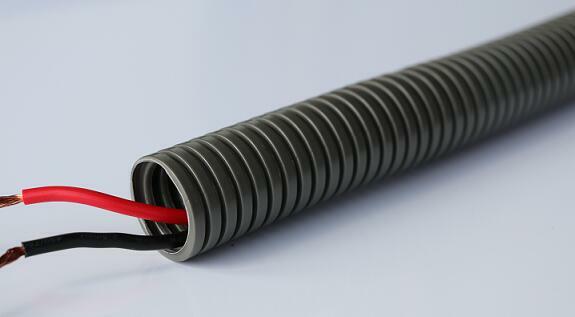 It is another option available for wire and cable protection. It is very similar to wire loom but is used for large application where as wire loom is usually used for smaller jobs like organizing computer cables or home theater system. If you are looking to run wires outdoors, for long lengths, and in conditions that might get unfavorable conduit should be your choice. In addition to the conduit itself, we offer a wide selection of accessories and fittings including flexible metal conduit, pvc coated flexible conduit, flexible conduit connectors, cable ties, cable glands, hose clamps, cable drag chain and heat shrink tubing etc. Welcome to send email for any questions.